Take the first step to improving your overall health with juice fasting detox retreat in a luxury leisure resort by the sea in the Algarve. Cleanse your body through a detoxifying meal plan or a medically approved juice fasting detox, spa and marine-based therapies and invigorating daily group activities. Located by the sea where nature is found in its purest state, Vilalara Thalassa Resort is the perfect choice for a health and wellness holiday retreat. Set within 11 hectares of lush gardens and with direct access to a secluded golden sand beach, this luxury resort is a seaside haven of style, comfort, and exclusivity. Vilalara Thalassa Resort has 104 Junior Suites and 7 Suites. Spacious, comfortable, decorated in cool neutral shades, fully equipped and with free wireless internet access, all Junior Suites and Suites feature a private balcony. Elegant rooms with modern and welcoming decor, the Junior Suites Garden View have a total area of 55m2, one large double or two twin beds of great comfort, a sitting area and an ample balcony which offers a beautiful view of the resort’s gardens. The bathroom with bath and the area of W/C are integrated although independent spaces. Junior Suite Pool View is elegant 55 m2 rooms furnished with one or two very comfortable large beds, with a modern and welcoming decor. The living room is an extension of the bedroom, and the bathroom includes a shower and a bathtub. The ample balcony offers a view of the resort pools. Junior Suite Sea View is elegant 55 m2 rooms furnished with one or two very comfortable large beds, with a modern and welcoming decor. The living room is an extension of the bedroom, and the bathroom includes a shower and a bathtub. The ample balcony offers a view of the sea. Vilalara Thalassa Resort is not an "Adults Only" Resort. Therefore, kindly expect to find families in the resort, especially during the Easter and summer holidays. Their beautiful and tranquil setting offers abundant relaxation and garden areas for peace and tranquillity of their wellness guests and the Thalassa & Medical Spa is an "Adults Only" facility. 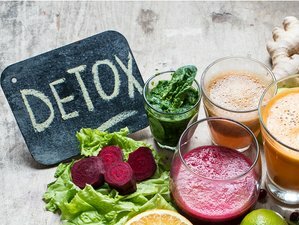 This Longevity Juice Fasting Detox 4 nights package is an individual program, meaning that the Thalassa & Medical Spa treatments included in the program are booked individually for each guest, and always according to the spa available slot times at the time of booking confirmation. Only the Longevity Vitality Plan daily group activities (which are also included in the program) are group classes - the group activities are subject to change and rotation, as well as seasonal adjustments. Upon arrival the guest is welcomed by a member of our wellness team, who will provide all information to the guest, including the Thalassa & medical Spa programme schedule, information on the daily group activities taking place during the guest’s stay, preparations for the detox, meals and meal times and locations, among all other information relevant to ensure the most pleasant stay. The wellness team will be available to assist the guest with any questions or needs during his/her stay at Vilalara Longevity Thalassa & Medical Spa. 1 Personal health check: including a health and lifestyle questionnaire, blood pressure, basic blood analysis. 1 Biophysical evaluation: measure body fat, muscle, body mass index (BMI), basal metabolic rate (BMR), the distribution of fat/muscle mass in the body as well as your metabolic versus your chronological age. 1 Osteopathy session: manipulative holistic treatments applied to remove blockages, restore mobility, and rebalance the musculoskeletal, visceral and craniosacral systems. 1 Manual lymphatic drainage: efficient therapy for reducing fluid retention, toxins release, treating poor circulation and swelling. 1 Multijet bath: relaxes muscles and joints and improves circulation. Effective at treating stress and fatigue. 1 Bubble bath: to treat cellulite and relax the muscular mass, giving a sense of wellbeing. Vilalara Longevity Thalassa & Medical Spa is a family-friendly wellness and leisure facility in a premium beachfront location. Located at Vilalara Thalassa Resort, Vilalara Longevity Thalassa & Medical Spa provides a unique fusion of Thalassa, spa, and state-of-the-art wellness and anti-aging solutions within a luxury leisure resort by the sea. Set within 11 hectares of lavish gardens and offering direct access to a secluded beach, this resort is home to one of the best Thalassotherapy Centres in the world. Complemented by five outdoor pools of fresh or sea water, four tennis courts, and two excellent restaurants. A true holiday sanctuary, each individual is guaranteed to depart feeling re-energized and rejuvenated. Vilalara Longevity Thalassa & Medical Spa is the ultimate family-friendly wellness destination, where spa lovers can relax and enjoy any of the longevity programs or wellness experiences, whilst the family doesn’t have to compromise on a fabulous holiday at a stunning beachside resort location. Mild detoxifying diet or liquid/juice fasting diet (detoxifying and anti-inflammatory shakes, juices, and soups) - up to 5 meals a day. The liquid/juice fasting diet is subject to our doctor’s approval. Please book your flight to arrive at Faro Airport (FAO). Transfers from and to Faro Airport (FAO) are available upon request. If you would like Vilalara Longevity Thalassa & Medical Spa to make the arrangements for airport transfer from Faro Airport (FAO), please advise them your flight number and the time of your arrival and they will organize a private airport transfer for you. Prices for private airport transfer from Faro Airport is from 68 EUR each way. Faro Airport (FAO) is located approximately 50 kilometers from the hotel (approximately 40-45 minutes by car transfer). Airport: Faro Airport Airport transfer available: Faro Airport (US$76 per person) Additional charges may apply. You can request this in the next step. A unique fusion of Thalassa, Spa, and state-of-the-art Wellness and Anti-Ageing Solutions within luxury leisure and family-friendly resort by the sea.